Lorenzo González is professor of Fine Arts at the University of Salamanca. 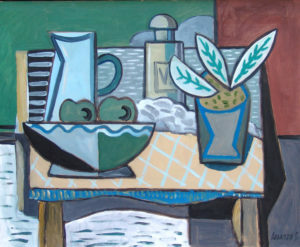 His exhibition is titled Interiors and this is a work that demonstrates the pictorial quality of the artist. He has been follower of the Spanish avant-gardes in Paris, as well as a good connoisseur of the Matisse lessons and the Torres Garcia’s constructivism. The composition of his paintings is a personal synthesis of compositional schemes, where vivid colors and cubist forms dominate. The inauguration,THURSDAY 7th OF FEBRUARY AT 7:30 p.m.,will be a good opportunity to meet personally the artist. He will tell us about his work. Mr. Josep M. Cadena will be in charge of the critical comment.